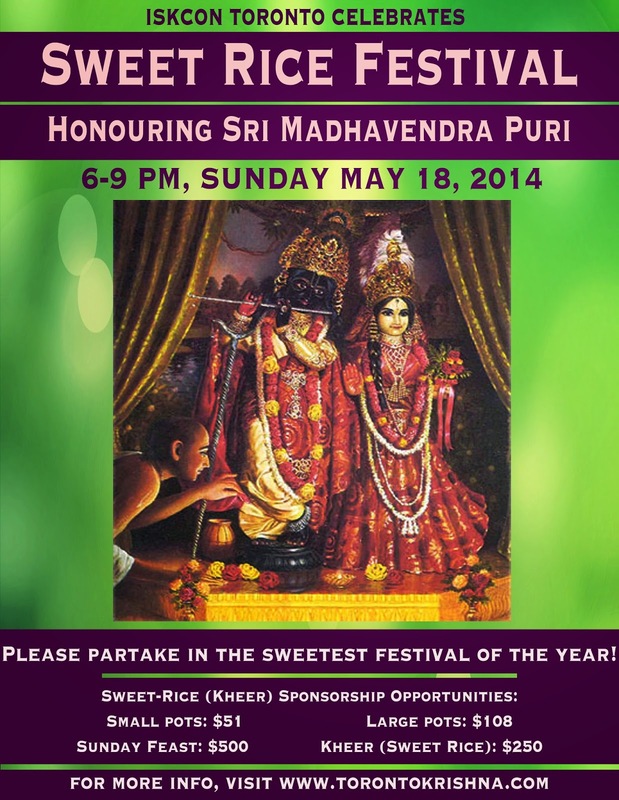 Sweet Rice Festival - Honouring Sri Madhavendra Puri! - May 18, 2014 ~ The Toronto Hare Krishna Temple! Our beautiful and beloved Deities, Sri Sri Radha Ksira-Chora Gopinatha, have been the heart and soul of our Hare Krishna Centre for over 40 years. 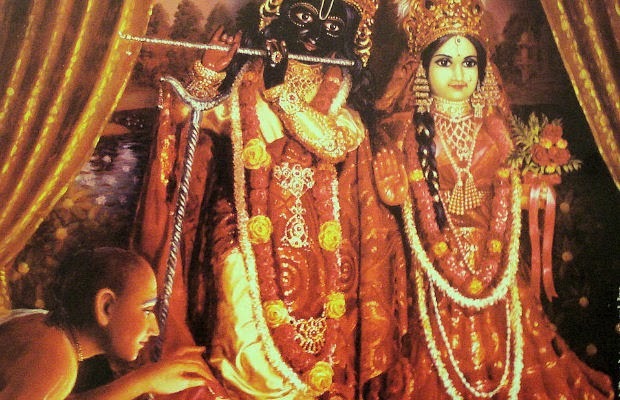 Actually, Srila Prabhupada named our Deities in Toronto after a famous Deity of the same name in the beautiful and ancient city of Remuna, India. Ksira means "sweet rice" and chora means "thief". So, the name "Ksira-Chora" translates into, "one who steals sweet rice". This famous Deity of Lord Krishna in Remuna was given this name after an incredible incident which occurred hundreds of years ago wherein the Deity actually stole a small pot of sweet rice for his devotee, Madhavendra Puri. Madhavendra Puri, a great 14 century saint in our lineage, had visited the ancient temple in Remuna and saw the priests (pujaris) offering small pots of sweet rice to the Deity. In his heart, he desired to taste the sweet rice so that he could create a similar preparation for his personal worship of his own Deity. Seeing the genuine sincerity in his heart, the Deity of the temple secretly hid one of the earthen pots of sweet rice offered every night and then appeared in the dream of the priest (pujari) and instructed him to locate the hidden pot and give it to Madhavendra Puri. In this way, the legend grew of the Gopinatha Deity which stole sweet rice for his devotee and thus Deity became known as "Ksira-Chora Gopinatha"! Many may not know this, but since our Deities were given their name in the early 1970s, sweet rice has been offered on our altar every day! On Sunday May 18, 2014, we are launching a new annual festival called the "Sweet Rice Festival" and we will be honouring Madhavendra Puri on this day along with relishing the wonderful story of Ksira-Chora Gopinatha! We hope everyone can make it for this special festival on Sunday, May 18, 2014!